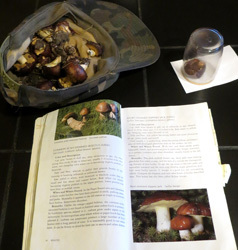 For some reason, we've had quite a few inquiries from readers recently which have essentially asked us to identify mushrooms based on descriptions or photographs. Sorry, folks, we just can't do that... no responsible mushroomer should EVER do so without being able to examine the actual mushrooms, in person. We take identifying very seriously. For one reason, when someone asks us to identify mushrooms they've found, it's usually because they contemplate EATING them! We all know that some wild mushrooms are poisonous and some are deadly so; how could we not take this seriously? A local friend had these Boletes growing in her yard. But what exact kind were they? Here, we take a spore print (under the upside-down glass) with our mushroom guide at the ready. And since this "discovery" was spur of the moment, we needed an impromptu "basket" to collect them: my cap! Here we are in the last full week in October of 2013. The weather has been spectacularly lovely: warm, clear days and cool, clear nights. Though things can change in a hurry, there's no mention of precipitation in the weather forecast until the first full week in November, and then, not all that much. So, what's not to like about that? Well, the mushrooms we're seeing now are, for the most part, the products of rains weeks ago; the ground is dry, and so are the mushrooms. New ones won't show themselves until they are given some water... at least not many of them. If it doesn't come in time, we may not get that second fruiting, a continuation of a season that started out as bountiful as any we've seen in years. And if we get a sudden, severe cold snap - well, for most species, that's the end of it for the year. We'll often cut a bolete in the woods to ensure that it's not infested. 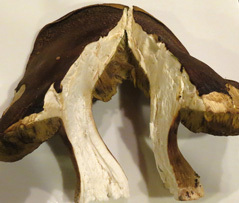 We often hear from readers of this site, and were very pleased to receive several e-mails recently from long-time reader Frank Kufel, who lives on the storied Kenai Peninsula in Alaska, who reported that this year, the highly-prized Boletus edulis was just about everywhere he looked! Frank has been mushrooming there for forty years, but has never seen such abundance as this year, and sent along photos to prove it! We've never seen Boletes in such profusion, and must confess to a little envy. Still, we certainly can't begrudge a harvest like this to someone who's been pursuing them for four full decades. Some things, however, are universal; he says that just because they are further North doesn't mean the Boletes up there don't share the tendency to get wormy quickly, if not cared for promptly. Like us, he dehydrates his Boletes. Frank tells us that mushrooming is almost always good there, with many species present; he especially likes the corals, which are a favorite of ours, too. 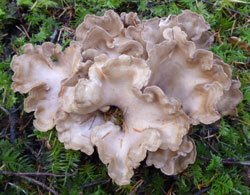 Several years ago, they had a fire near where he lives, and the resultant fruiting of Morels was something to behold! 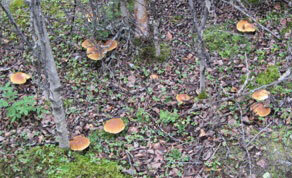 We've visited the Kenai for fishing, but not for mushrooms; it sounds as though a return visit just might be in order! King Boletes, Matsutakes, White Chanterelles - Need I Say More? As the late, great Seattle sportscaster Dave Niehaus used to say at key moments in Mariner ballgames, "My, oh my!" That's how I feel about this fall's mushrooming season. We spent the afternoon of October 9th at our favorite matsutake spot on Mt. Hood. Around the 3,000-4,000' elevation, the air was cool and uninviting, but the forest floor welcomed us with a crop of newly fruited matsutakes. In very short order, we gathered an impressive basketful of the fragrant fungi, which we dehydrated upon returning to Port Orford. We prepared the tough stems separately from the sliced caps so that we could conveniently powder them for use in coatings and seasoning mixes. 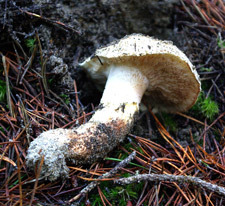 We'll be donating the sliced caps and powdered stems of the matsutakes to the 73rd Annual Wild Game Banquet, which will most likely be held at the Monarch Hotel in Clackamas again this Spring. Steven's the banquet mycologist and a long-time part of the chef-for-a-day crew for the charity event, which raises money for the Boys & Girls Club of Portland, the Friends of the Children, and the Boys and Girls Aid Society of Oregon. But, wait, there were more than matsutakes in them there woods! 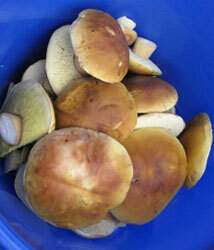 Stately king boletes and white chanterelles weren't going to be outdone by the matsutakes. 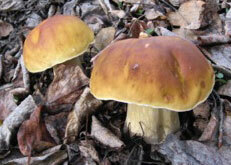 They, too, were abundant in our usual harvesting areas on the mountain. The stem - conical at its base - is an important identifier for matsutaki. We were out of state much of September and didn't return to Port Orford and its mushroom woods until late on the 29th ... and, wow, did it take my breath away! The first storm of the season was just beginning to die out when we drove up into the reserve, but not before it had unleashed winds in excess of 60 miles an hour on Saturday and Sunday and drenched the forest floor with almost 4" of rain in that same 48 hour period! What a welcome home that was! September was actually quite a damp month in Curry County, with a rainfall total of about 5.5;" our historic average rainfall for September is 1.5". All in all, it's been a rather dry year, with our year-to-date rainfall for 2013 registering a paltry 33.5". In a typical year, our annual rainfall approaches 72," with about 30" falling in the latter part of the year. Looks to me like we've got some catching up to do to meet our usual accumulation in the rain gauge. Don't get me wrong - I'm not complaining about the rain! When you know that mushrooms relish the arrival of the rainy season, it's a little difficult not to rejoice in this kind of abundance. And, it's clear that the edible mushrooms have indeed made a powerful entrance into the reserve. A 5 minute stop on the way up to the house yesterday at our "ace in the hole" spot probably produced more clumps of pig's ears (Gomphus clavatus or Cantharellus clavatus) growing in the animal trail between conifers than we have harvested in the last 15 years! The fruitings were perfect, firm and bug-free (which isn't necessarily the case with pig's ears), and in a location where we'd never found them before. Such abundance took my breath away! Pig's ears are a welcome guest at the reserve. I'm sometimes reluctant to prepare filled crepes, citing all the familiar excuses: they take too much time to prepare, they are difficult to assemble, they aren't for everyday dining, etc., etc. But, the bottom line is: they don't take too long to prepare or assemble, and they do turn an ordinary weeknight dinner into something special with very little effort! Give this month's incredible edible (Shrimp, Ham & Mushroom Filled Crepes) a try, and I'm confident that you'll agree with me. The cauliflower mushroom is always our choice for this recipe. Its firm texture (even when cooked) adds a crunchiness to the filling that serves to elevate the texture of the dish far beyond the ordinary. And, there is a bonus with this recipe. Leftovers can easily and very successfully be reheated for delightful lunch or snack on another day. Simply place a filled crepe on a plate and microwave for about 45 seconds. You'll be rewarded with a delicious treat!